The PURSUIT Dodge Challenger RT stripes package 2011-2014 2015 2016 2017 2018 and 2019 Pursuit Side Graphic Stripe Decals Kit is a pre-cut, ready to fit, T/A style vinyl decals kit that complements perfectly the muscle car style of the Dodge Challenger TA Stripes. These Dodge Challenger RT decals and Dodge Challenger mopar decals are not made of low quality, sign grade vinyl, they are made of the best quality, high performance automotive grade 3M vinyl. It’s the quality of the vinyl that we use in all our Dodge Challenger body stripes that ensures that you get a superb finish that lasts, every single time. The Dodge Challenger RT decals are precision cut for an easy to install, straight out of the box, fit. These are the best quality side graphic stripe decals for the 2015 Dodge Challenger RT stripes that money can buy! The thick upper door decals of the Dodge Challenger Pursuit body line side door panel vinyl graphics are just what you need to give definition to the distinctive body lines of the Dodge Charger and give it true rally racing style. 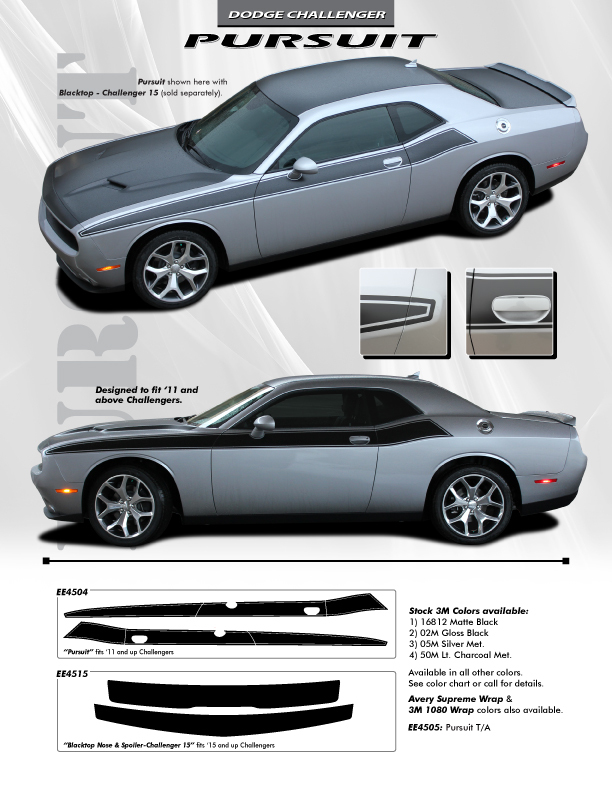 Dodge Challenger Pursuit wide upper door vinyl graphics kits don’t get any better than this! You won’t find better quality vinyl decals stripes for the 2014 Dodge Challenger RT stripes at these low prices anywhere else. Check out this YouTube Video for install tips.